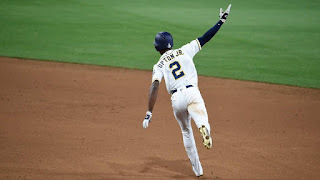 Melvin Upton, Jr.'s two-out, two-run homer off Rubby De La Rosa in the 14th inning landed just out of the reach of a leaping David Peralta in center and lifted the Padres to a 5-3 walk-off win over the D-backs on Saturday night at Petco Park to even the weekend series at a game apiece. "That swing right there brings life not just into the day but also the season," Padres manager Andry Green said. The Padres built a 3-0 lead thanks to a two-run second inning during which D-backs starterShelby Miller struggled with his command and was forced to leave due to an injury. Alexei Ramirez drove home a run in the inning and moved to third on an error by center fielderSocrates Brito while Jon Jay drew a bases-loaded walk. Matt Kemp added a solo home run in the third for the Padres and right-hander Andrew Cashner kept the D-backs in check until fifth when Jean Segura's groundout scoredYasmany Tomas. The D-backs were able to push across an unearned run in the seventh before tying up the game in the eighth when Rickie Weeks Jr. scored from third on Brandon Maurer's wild pitch. "Good battle, man," D-backs manager Chip Hale said. " Both teams. They made some great plays. We made some great plays. We just sort of, kind of ran out. Rubby did the best he could." Bullpen worn out: With Miller's early departure the D-backs relievers wound up having to throw 12 innings. Arizona used its entire bullpen plus De La Rosa, who was scheduled to start Monday. The 'pen allowed three runs, two of which came on the game-winning homer. "I think the amount that we fought tonight and competed, especially losing Shelby so early, I think it showed a lot of character in our team," said closer Brad Ziegler, who threw two innings. "Obviously the bullpen, those guys threw great tonight to keep the score where it was and give us a chance to come back. We fought, but we just couldn't get that one more run that we needed." Short outing: Miller scraped his right hand on the mound during his follow through on a 1-1 pitch to Cashner in the second causing cuts on both of the knuckles on his index finger. His departure one batter later forced an already-depleted Arizona bullpen to pick up 11 1/3 innings. "My mechanics were kind of out of whack and my hand kind of hit the ground a couple of times," Miller said. Kemp KO's another HR: Matt Kemp slugged his fourth home run of the season when he stroked a 1-0 changeup into the left-field seats for a 3-0 Padres lead in the third. For Kemp, it was his 31st home run against the D-backs. Among active players, only Adrian Gonzalez(34), has more homers vs. Arizona. Quack attack: Kevin Quackenbush relieved Casher in the seventh and the D-backs nearly got even. Quackenbush allowed a double to Tomas and he scored on Drury's sacrifice fly to pull Arizona to within 3-2. The run was unearned because Upton Jr. misplayed Tomas' double. Upton provided the first walk-off win of the season for the Padres with his homer in the 14th inning. It was also the 100th walk-off victory in Petco Park history and the Padres' 16th against Arizona, the most vs. any opponent. The D-backs tied the game in the eighth inning after a review upheld Weeks being safe at home after a wild pitch by Maurer. Weeks raced to the plate and just beat Maurer's tag fromDerek Norris' relay, a call which stood after a 2:08 delay. Ramirez led off the ninth by drawing a walk and he proceeded to steal second. The D-backs challenged the ruling on the field and the call was overturned, which proved to be important because one out later Cory Spangenberg singled to center. D-backs: Patrick Corbin will get the start Sunday at Petco Park in the series finale. The left-hander was the team's best pitcher during the spring and he's carried that over into the regular season. In two career starts at Petco Park, he is 1-1 with a 2.92 ERA. Padres: San Diego ends its three-game series against Arizona by sending Robbie Erlin (1-1, 0.93) out to face Corbin (0-1, 3.46) in a battle of left-handers. Erlin, who didn't make the Opening Day roster, has been solid since being summoned on April 8 from Triple-A. He's making his second start this year, with his win coming in his lone relief appearance.